Two out of three isn't bad - or is it? 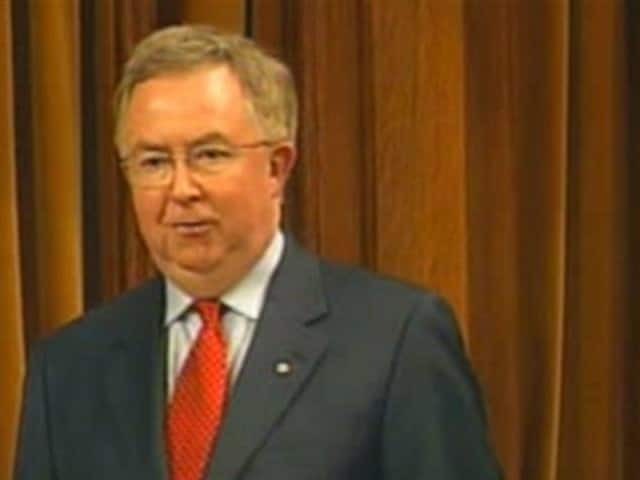 After receiving the support of 66 per cent of Progressive Conservative delegates in 1981, Joe Clark vowed to unite his party. Two years later, the question is posed again: "Do you wish to have a leadership convention?" The answer is virtually unchanged: 66.9 per cent of delegates want to stick with their leader. In this CBC television special, Clark announces that 66 per cent isn't good enough this time. If the party is to win the next election, it must be solidly behind its leader. In a bold bid to secure the unity of his party, Clark tells 2,400 assembled delegates that he is calling a leadership convention as soon as possible. And, he says over cheers of "Joe! Joe! Joe! ", he will run for the job again. As Clark is carried off on the shoulders of his supporters, CBC commentators Mike Duffy and Peter Mansbridge praise his "gutsy political move." • Under the Progressive Conservative constitution, leadership reviews were mandatory at party conventions every two years. • Clark's first leadership review took place in November 1977. A year and nine months after electing him leader, 93.1 per cent of 1,031 delegates voted in support of Clark's leadership. • By comparison, Pierre Trudeau had received 81 per cent support from his party two years earlier. • A year after he was defeated as prime minister, Clark faced another leadership review in February 1981. Though 1,409 delegates (about 66 per cent) voted in his favour, another 714 (about 34 per cent) said they wanted a new leader. • Clark took the 1981 results as an endorsement. "We are emerging here as a united and renewed political party, a national party that has settled our differences... and now is going to build together for a solid footing." • According to the book Contenders: The Tory Quest for Power, by Patrick Martin, Allan Gregg and George Perlin (1983), ideology wasn't the reason most anti-Clark voters voted for a leadership review. • Rather, 26 per cent of those opposed to Clark said they doubted "his judgment, managerial ability, and general aptitude for leadership." Another 25 per cent cited his "public image as an incompetent leader." • In 1980, Mulroney began making a series of speeches in which he indirectly blamed Clark for the party's poor election showing in Quebec. • Publicly, Mulroney supported the leader. "Joe Clark won one and lost one [election]," he told CBC Radio in December 1980. "This is an old baseball town and we don't put .500 hitters on waivers... I'm going to vote for Mr. Clark." • Meanwhile, Mulroney had assembled a team whose goal was to unseat Clark. • A group of Tory MPs had also begun a secret campaign to boost opposition to Clark from within his own caucus. • On Dec. 6, 1982, Mulroney surprised everyone by posing for photos with Clark and appearing to withdraw as a potential challenger for the leadership. He read a carefully crafted statement emphasizing the importance of electing a Progressive Conservative government. Confirming Clark's leadership, he said, was a key part of the process. • This was, in fact, a strategic move by Mulroney's team to ensure that he wasn't blamed for Clark's ouster. • Going into the January 1983 convention, Clark and his party had the support of 49 per cent of Canadian voters, according to a Gallup poll. But many party delegates doubted Clark could win the next election. • Some of the most visible members of the dump-Clark movement were from the Ontario wing of the Tory youth caucus. "Can you do it for real, Joe?" one of them heckled as Clark addressed a group of youth at the convention. • Because his party was thriving in national polls, Clark expected to gain more than 66 per cent support. His failure to do so led to his decision to throw the leadership up for grabs. • Ironically for Clark, delegates at the 1983 convention also agreed to amend the party constitution so that a leadership review would happen only after the party lost a federal election. This would end the very process that forced his resignation. • Editorialists at the Globe and Mail said: "Mr. Clark's 'difficult choice' was, in fact, the only one he could make" because it would force his critics to "publicly measure themselves against the not inconsiderable talents of the present leader." • Though some members of his caucus supported Clark's ouster, others stood up for him. Manitoba MP Jake Epp called him "the most honest politician in Canada for a long time."